Unhappy with Cloudboss.pro after 30 days? Let our support team know and we will immediately issue a full refund - we have NEVER not refunded anyone dissatisfied with the service. 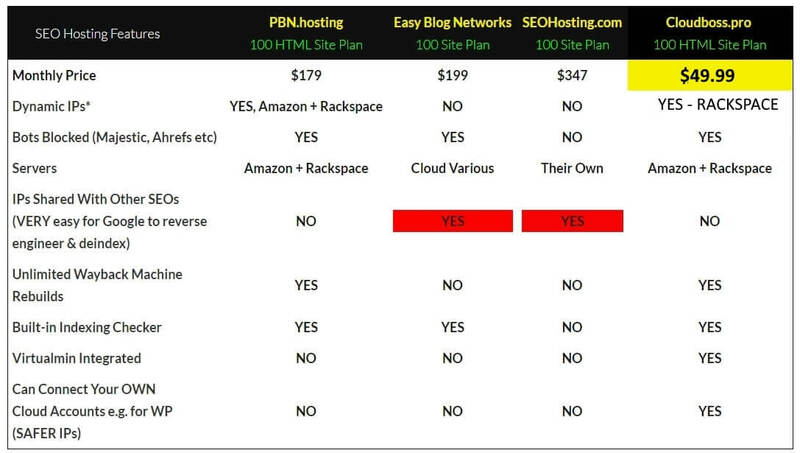 So just how dangerous is it for your PBN sites to use old-school SEO Hosting with IPs shared among other SEOs? Here, once an IP address belonging to an 'Easy Blog Network' or SEO Hosting service is found, seeing ALL the sites hosted there takes Google less than 2 seconds e.g. Hi, I'm Terry Kyle, creator of CloudBoss.pro and you may know me as the owner of Traffic Planet or as one of the co-founders of WPX Hosting, or a co-founder of Backlinks Forum back in the day, or through various other SEO platforms of products and services like Bluechip Backlinks, or SEO Traffic Hacks for example. Now when it comes to SEO hosting, I've used pretty much every SEO hosting company in the world and normal hosting company probably twice over in about the last eight or nine years while working with expired domains and PBNs on a pretty big scale - in the thousands of sites typically. And the reason why I decided to create CloudBoss.pro was that I got fed up with all the limitations and problems of those other existing SEO web hosting companies and platforms. What makes CloudBoss.pro different is the fact that it’s a very powerful toolset to connect you with all of the major cloud platforms on the web like Amazon EC2, Amazon S3, Amazon Lightsail, Linode, Vultr and DigitalOcean. These are the world’s biggest Cloud platforms - with Amazon AWS, for example, they have by our calculations at least 12 million IP addresses. So, they have a huge amount of IPs across 14 data centres, last time that we counted. The way that CloudBoss.pro works is that you get your own Amazon AWS account, or DigitalOcean account, or Vultr account and you connect that to CloudBoss.pro. 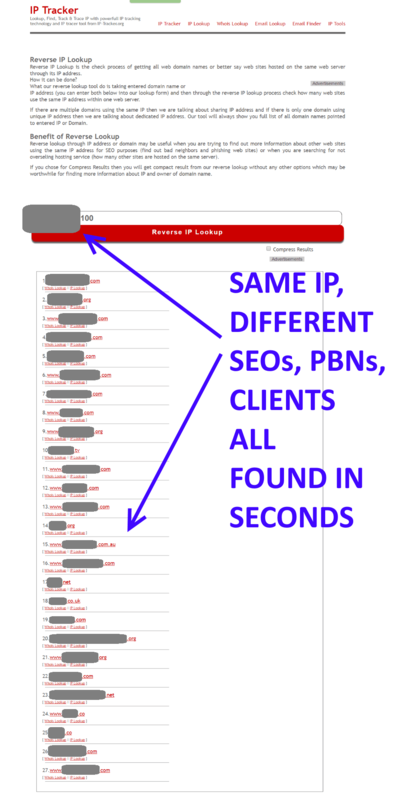 As a result, only your sites are on this account and the IPs that you'll be given in almost every case will either have no other sites on them, or they'll have completely legitimate websites and not be packed with SEO guys using an SEO hosting account where you're just all sharing the same IPs and Google can obviously find and deindex those in seconds. Cloudboss.pro is quite a different way of doing SEO hosting and if for example, like I do, you use a lot of archive.org rebuilt sites on expired domains using their Wayback Machine. You actually have an unlimited site rebuilder with archive.org inside CloudBoss.pro, there's no cost or limitation there, you can literally rebuild as many sites as you want. And these are HTML sites, not WordPress and host these on Amazon S3, remember it would be in your own account, nobody else has access to that, nobody is using your IPs. On Amazon S3 with these HTML sites, usually they're quite small sites, rebuilt from the Wayback Machine, you can host each for around about 10 to 30 cents a month per site. You won’t get that much real traffic and that's not important plus obviously 10 to 30 cents a month, this is on top of your CloudBoss.pro subscription, but if you're working at scale like you've got 50, 100, 200, 500 or 1000, or more sites, when you're hosting for 10 to 30 cents a month per site, this is a game-changing level of value when you consider that typically it'll be $1 to $1.5 to $2 per IP – or much, much more - on old-school ancient SEO hosting. Then go in there, hook up your own Amazon AWS account, I recommend Amazon because it's a vast platform with a ton of normal legitimate websites on there and that's perfect for these SEO hosted sites. If you are absolutely committed to WordPress, for example, I'm not, we use virtually no WordPress in our huge PBNs here, but If you are committed to WordPress, you can hook up smaller accounts from EC2. It is quite a bit more expensive, like at least $5 to $7 per VPS a month there.Other options are there too, like DigitalOcean, where you can have a VPS for $5 a month but obviously, that's like a little VPS where it's just one IP.But what you can do there is get a bunch of free Cloudflare accounts/IPs and there's a particular way to do it and we teach that inside CloudBoss.pro where you're masking your different WordPress sites on the same IP with a bunch of different Cloudflare IPs. Obviously, there are just hundreds of thousands, or a million+ sites using Cloudflare IPs as well. Now, if you have any questions about this, if anything isn't clear from what I've explained, please just contact the Live Chat team down in the bottom right-hand corner, or you can email us at support(at)cloudboss.pro and we can explain it further. But the SEO guys who are using this, are using Cloudboss.pro at scale and saving a huge amount of money. All of the tools that are there in CloudBoss.pro to upload sites, to edit HTML sites, FTP, monitoring your indexing status, checking on your Trust Flow, Virtualmin etc, most of those things are done for you on an automatic basis in CloudBoss.pro. So, I look forward to your questions and hopefully I'll see you on the inside for your $1 trial where you can see how CloudBoss.pro can really revolutionize your SEO hosting and save you a lot of money while also protecting those PBN sites from being deindexed by being on shared accounts on other SEO hosting companies.